We were served an appetizer while waiting for our orders. And no, it wasn’t free. I think they charged us RM4 for it…what a way to make money out of people. Nonetheless, it was nice. The har gao was also not bad. 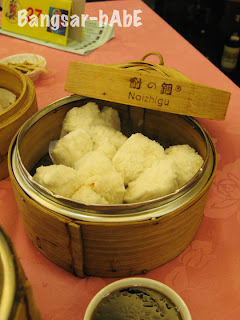 Better than most of the har gaos I’ve tasted at other dim sum establishments. The skin was not too thick and the prawns were plump and juicy. The Yam Dumpling was alright. 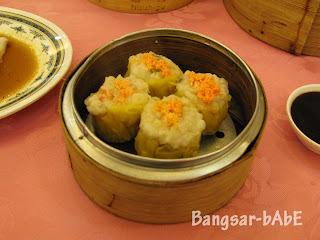 I prefer my yam dumpling to have the same filling as the char siu pau. This one however was made out of minced pork and mushrooms. The Siew Mai was nice. Daintily wrapped and topped with fish eggs (yeah rite), I relished every bite of juicy prawns and chunky pork pieces. The Char Siu bun was also very good. Delicious BBQ minced pork encased in light, fluffy bun. It’s best eaten when it’s hot. We ate the last bun when it was cold so it wasn’t as nice as the other two which we ate piping hot. 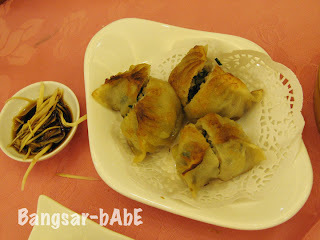 The pan fried dumpling was not too bad although I’ve had better ones from Esquire Kitchen. These ones lost out because of the skin; it wasn’t as crispy or as light as the ones from Esquire. 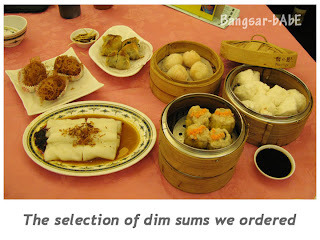 Price-wise, it’s more expensive than the usual dim sum places; almost double the price. Taste-wise, this one wins hands down. Also, I didn’t feel as thirsty as I normally would after eating dim sum so I presume they use less MSG in their cooking. So quality or quantity; you decide. Kam Lun Tai Seri Petaling bad experience eating bread on 13/02/2010 Sat Chinese New Year family dinner eve. This place always encounter this problem. We arrive at 8pm as set by them. 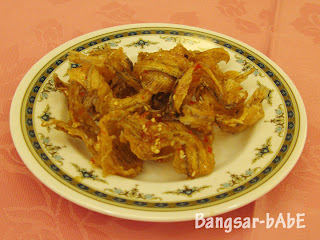 We wait till 9pm nothing was serve, we enquire why our dishes was not serve even a yee sang. They shout at me, "Everyone here also waiting". I told her, my next table came late than me, already got something to eat why we don't have? They said " we issue the food to everyone now". Not only we make complain, others table eating half way not getting they food. My family members can't stand anymore they go shell petrol station to buy bread to eat. At 10pm our dishes was not serve, not even a yee sang after an hour, we want to meet their manager but she go to hide don't want to meet anyone. That make us angry, we ask the kitchen what happen? Why do they haven't serve any dishes to us? They angry scold us, out of that my few brothers start arguement with them that everyone in the place see. Some of the customer left without finish their dinner because don't want to wait. They willing to pay full, for half dinner. When a lot of table left, they one short bring all the 9 dishes to our table. When I check with one of the waiter, he told me every time encounter this problem. When I paid my bill at 11.45pm, I ask the cashier do you have any feedback form, the answer is "NO". I want to make complain, they don't bother to answer me. Beware of this restaurant that spoil your family mood.